After my snow card won at Merry Monday last year, I was delighted to be asked to be a Guest Designer for this year's first challenge (and get my first Christmas card for 2015 finished!). The challenge is to use a snowflake on your Christmas card. I used similar colours to the inspiration photo, using a Papertrey snowflake and a Tim Holtz sentiment, with pearl embellishments. I think that the font and the colours give my card a retro feel - fun! Definitely a retro Ardyth feel. Love the touch of pearls. Beautiful card! 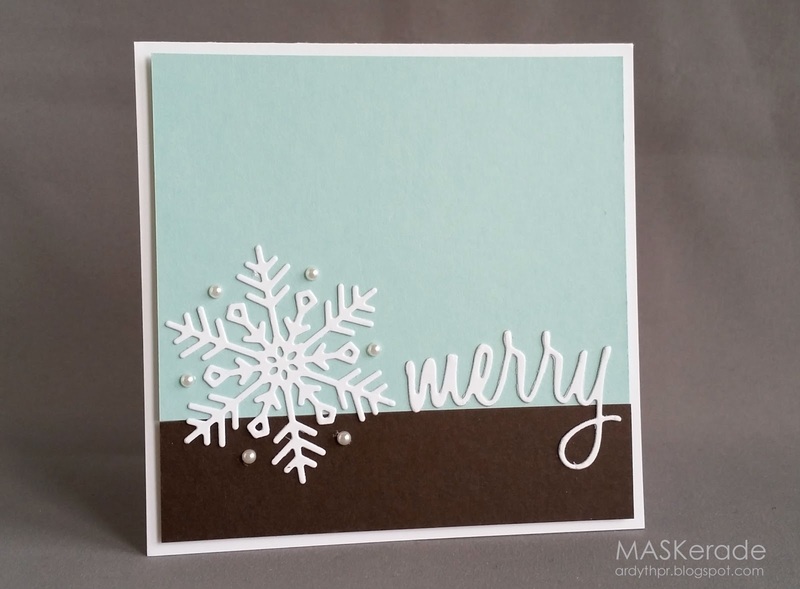 Great use of the inspiration photo - the colors are perfect and the snowflake is so delicate and pretty. Congrats on being a guest designer. Love this pretty card--the snowflake really pops against your color blocked background, and the pearls are a great addition. 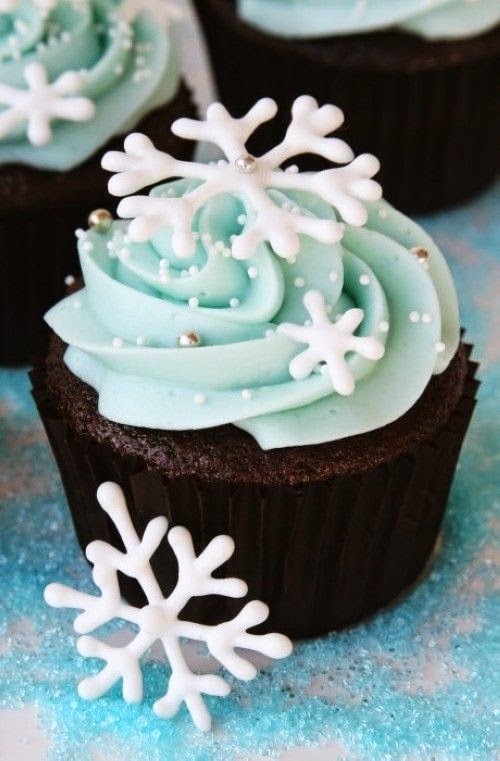 Love it, great color combo and pretty snowflake. Love those colors and your design. I absolutely love this Ardyth!! The colors are so wonderful and I love the snowflake and pearls! Thanks for being GD at our challenge - your card is beautiful. The pearls really add a touch of elegance and the font on the sentiment is very cool. I love your dainty snowflake and how you added the "chocolate cake" to your card! Yum! I'm so glad you could join our team this week! Perfect take on the inspiration! Gorgeous card! This is a striking card. The colors are original too. Since I happened to have this snowflake die I like it even better. You are doing pretty darn good on getting your cards done in time for Christmas. EEEK! LOVE this, Ardyth! Such a cool retro feel. So great having you as guest designer at Merry Monday! Love all your cards. Hugs! Congrats on your win Ardyth and Happy New Year!! Love your card, perfect take on the photo! Yay, hoorah for getting ahead, I can't wait to too....lovely! Totally beautiful simplicity Ardyth - what a great interpretation of the photo too! So glad to have you as our GD this week - you rocked it! Ardyth...your card is just so pretty and looks like a flat delicious cupcake with those beautiful colors. I love it and can not wait to CASE you! Ardyth, your card is stunning! Simple, yet very elegant - love it! So thrilled to have you as our Guest Designer this week at Merry Monday! Awesome Ardyth, gorgeous CAS design. Congratulation's on being our Guest Designer this week at Merry Monday. Ardyth, such a beautiful card! Awesome take on the inspiration photo! It is so great to have you with us at MM! Hugs! Very, very pretty! Love the colours! So glad you are joining us as a guest designer, your CAS card is so pretty. Such a pretty card. Love the addition of the brown! I hope you had a great Christmas and New Year! I love this beautiful bold ad graphic color palette! Great design! Yep - new #1 favorite! Beyond stunning!